I came across your blog in my search for more information on professional CD ripping/conversion. Because this is new to me, I am concerned about the quality and legalities of the product returned. My main question is what my files will be returned on. Is it another CD (just in MP3 format) or a DVD or USB? I assume these are the most common devices used with conversion. My other question is what equipment is used to convert? I have huge selection and want to know how many equipment can do at one time. I see that you suggested and referenced dmp3digital, and they seem to have some great services. Do you have any information on the equipment that they use? Or in a general sense? Normally a DVD or external hard drive will be used, due to data sizing. You'll only fit ten or so lossless formatted albums on a CD (more if you use MP3, but I'd advise against that... maybe order an MP3 copy in addition to a lossless copy). If it's a hard drive you'll either have to provide that or purchase it as part of the conversion. Regards quality, there are different ways of measuring this. 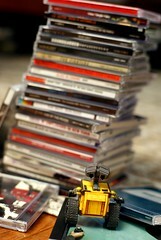 The quality of the audio will depend on the format that is used, as above I suggest lossless which will be CD quality. MP3 won't be as good, but has benefits - better support from different players. You can probably choose the "bit rate" of the MP3 which dictates the quality (at the cost of storage space). Thanks to Dave for the image above.